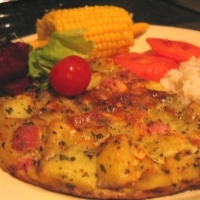 Deliscious Spanish Omelette that's easy to make and tastes great. Complements many sides well especially salads and cold sliced meats. 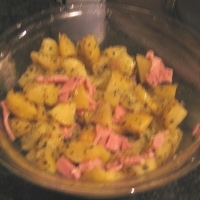 Cook until the potatoes are slightly soft (dont let them brown). Turn them regularly with a spatula. 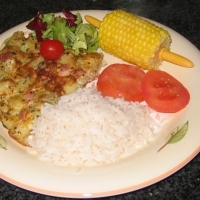 While potatoes are cooking you can add herb ingredients like Oregano, Mixed Herbs, Basil etc - to your taste. 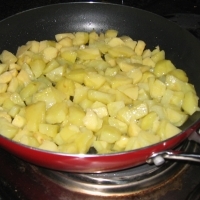 When potatoes are ready use spatula to take them out into a mixing bowl. Slice up 1-2 slices of ham into small squares. 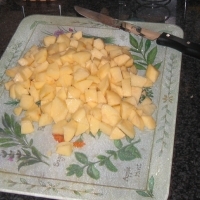 Add these to the bowl of potatoes and mix it through. 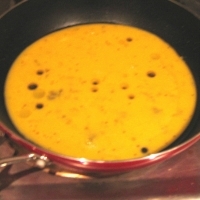 With oil still in the pan add the beaten eggs to the pan. 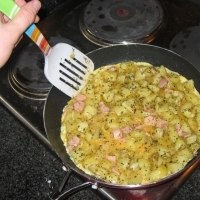 Then add the potato mix to the pan on top of the eggs. At this point you could add something like sliced tomatoes to the top of the omelette if you like and press them down slightly so they are flush with the rest of the ingredients. It will now start to come together. Over the next 10 mins or so keep running a spatula around the side of the pan to prevent the omelette from sticking. You will know when the omelette is ready when if you gently lift up part of the omelette with the spatula it is brown underneath and there are no juices running. 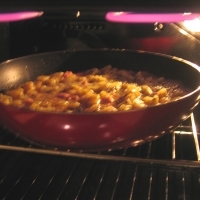 Then you take the pan and put it under the grill. After a few mins the omelette will begin to solidify on top and then its done. Like alanmac's recipes? Never miss an upload!